Hong Kong Airlines always strives to offer you the best and diversified services onboard. That’s why we have prepared pre-paid excess baggage for our valued passengers. on HKA official website, mobile APP or Wechat platform. Equivalent in local currency by the exchange rate for USD at the point of sale. #You may also consult pre-paid excess baggage by Call Center. 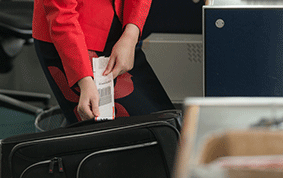 Click Here to read "Hongkong Airlines Baggage Rules"
Please make your reservation at least twenty-four (24) hours prior to the scheduled flight departure at Hong Kong Airlines official website. Or you can choose in the value-added services section on our official website after your successful booking. - Carriage of pre-paid excess checked baggage is subject to Hong Kong Airlines Conditions of Carriage and its regulations. of our Conditions of Carriage. - Pre-paid excess checked baggage allowance is not transferable and must be used with the section(s) it was originally purchased for. - Pre-purchase of excess checked baggage allowance is only available on flights operated by Hong Kong Airlines. - Pre-purchase excess checked baggage allowance is charged according to Hong Kong Airlines ‘Extra Baggage Charges’ schedule. - Charges for the pre-paid excess checked baggage allowance will not accrue any Fortune Wings Club miles. - Pre-purchase excess checked baggage allowance is only accepted with a valid electronic ticket. and/or aircraft, pre-paid excess checked baggage allowances will not be endorsed. may be required to pay extra excess checked baggage fees if the actual baggage weight exceeds the pre-paid excess baggage allowance. excess checked allowance is applied before scheduled flight departure. Refund application should be submitted to the office of ticket issuance; or the flight is cancelled by Hong Kong Airlines. - Pre-paid excess baggage is not applicable to interline tickets.